Difference between revisions of "Morgan's Raiders"
| caption = View of the entry of Morgan's Raiders into Washington,	Ohio, from Harper's Weekly, Saturday, August 15, 1863. In July 1863 Confederate Brigadier General John	Hunt Morgan lead approximately 1,400 calvarymen on	a 13 day raid through southern and eastern Ohio. At the Battle of Buffington Island, 750 men were captured and 300 escaped across the Ohio River. Morgan and 400 men headed north after the battle and were captured in Columbiana County, Ohio. 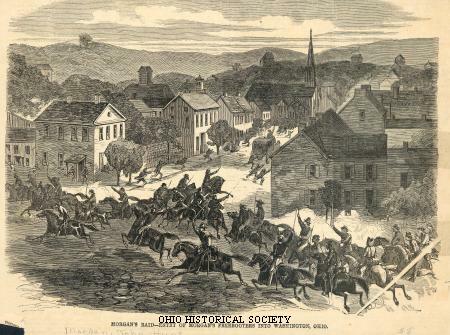 | caption = View of the entry of Morgan's Raiders into Washington, Ohio, from Harper's Weekly, Saturday, August 15, 1863. In July 1863 Confederate Brigadier General John Hunt Morgan lead approximately 1,400 calvarymen on a 13 day raid through southern and eastern Ohio. At the Battle of Buffington Island, 750 men were captured and 300 escaped across the Ohio River. Morgan and 400 men headed north after the battle and were captured in Columbiana County, Ohio. On July 8, 1863, Brigadier-General John Hunt Morgan led approximately two thousand soldiers across the Ohio River into southern Indiana. Morgan's superiors had dispatched the cavalry leader into northern Kentucky to cause disorder among the Union military. Morgan exceeded these orders by crossing north of the Ohio River, but he did create turmoil for the United States army. Crossing into Indiana, Morgan's Raiders spread false rumors that the Confederates intended to attack Indianapolis, Indiana. Rather than doing this, the men spent five days in southern Indiana, procuring supplies and horses from Northern civilians. On July 13, as the Indiana militia descended upon Morgan's men, the Confederates entered Ohio, near the Hamilton-Butler County line. Morgan led his men to the outskirts of Cincinnati, where he spent the night of July 13-14, within sight of the Union army's Camp Dennison. The next day, Morgan divided his men. He sent a small group through Warren, Clinton, Fayette, Ross, and Jackson Counties, while the main force traveled through Clermont, Brown, Highland, Pike, and Jackson Counties. The larger group crossed the Scioto River at Piketon and proceeded to Jackson, where it reunited with the smaller detachment. The reunited Confederates proceeded east through Jackson, Gallia, Vinton, and Meigs Counties, in an effort to reach the Ohio River. On the night of July 12, Ohio Governor David Tod issued a proclamation, calling out the Ohio militia to protect the southern counties from Morgan's Raiders. Many militiamen did not hear of the proclamation in a timely manner. The Confederates faced little opposition until July 18, when they encountered a small earthwork, defended by Ohio militiamen. Severely outnumbered, the militiamen retreated under the cover of darkness. However, their presence had allowed Union cavalry, under Brigadier-General E.H. Hobson, to catch up to the Confederates. Union General Ambrose Burnside also had sent Northern soldiers and gunboats to patrol the Ohio River, hoping to capture Morgan's entire force. Morgan's men attempted to cross the Ohio River at a ford near Buffington Island. The Confederates succeeded in getting a small number of men across the river before Union gunboats and soldiers under Hobson and General H.M. Judah arrived. A battle ensued at Buffington Island. The Northern force numbered approximately three thousand men, while Morgan's Raiders included 1,700 soldiers. Some uncertainty exists about the battle. Morgan hoped to lead his men across the Ohio River, and Union soldiers and gunboats intercepted him. Morgan did not file a battle report, and the Union officers involved left out many details in their final reports. Estimates for the number of wounded or killed Southerners range from fifty-two to 120 men. Union soldiers captured an additional eight hundred to 1,200 men. Among the captured men was Morgan's brother-in-law. Northern soldiers lost twenty-five men in the battle, including Daniel McCook of the Fighting McCooks. During the Civil War, fifteen McCook family members fought for the North, earning these men the nickname, the Fighting McCooks. The Northern soldiers took Morgan and most of his captured men to Columbus. The enlisted men were confined in the Camp Chase Confederate prison camp. Morgan and several of his officers were held at the Ohio Penitentiary. Morgan arrived there on October 1. He and several of his men immediately made plans to escape. They tunneled out of a cell into an airshaft on November 13, 1863. They remained in their cells until November 27, when Morgan and six of his soldiers used the airshaft to reach the prison yard. They then fashioned a rope from their prison uniforms and scaled the wall. Utilizing some of the one thousand dollars that his sister had smuggled into the prison inside of a Bible, Morgan purchased a train ticket to Cincinnati. He then made his escape across the Ohio River into Kentucky. Morgan returned to the Confederate military but lost his life less than a year later on the battlefield. Morgan's Raid netted few positive results for the Southern military. It did provide some hope to Confederate civilians that their military could still succeed following the Northern victories at Gettysburg and Vicksburg in early July 1863. It also caused a great deal of fear among Indiana and Ohio residents and cost several of these people some personal property that the raiders had seized. Almost 4,400 Ohioans filed claims for compensation with the federal government for items that they lost to the Confederates during the raid. The claims amounted to 678,915 dollars, with the government authorizing compensation in the amount of 576,225 dollars. While the Confederates succeeded in instilling fear in the civilian population, the raid inspired many of these people to fight even harder to defeat the Confederacy. In addition, the Confederate military lost an entire division of veteran cavalrymen. Morgan also failed to destroy any railroad tracks, bridges, or supply depots. The raid caused no significant harm to the transportation and communication infrastructure of the North. The raid had as many negative effects as positive ones for the Confederacy.